Recently, I had the opportunity to speak at the University of Texas at Austin’s McCombs School of Business’ “2019 Economic Forecast.” It was quite exciting to return to my alma mater and speak about the work our company is doing to push the government technology revolution forward. Dr. Mark Shen, president of St. Louis Children’s Hospital, and Mine Kuban Yücel, senior vice president and senior research advisor at the Federal Reserve Bank of Dallas were also featured as speakers at the event. 1) A community must digitize all the data they have and will have and combine them into a standard data set. That means data from legacy systems cannot be left behind. 2) A community must invest in Internet of Things (IoT) devices (such as sensors to detect traffic patterns) in order to generate real-time data. 3) That data must be analyzed in the most efficient way possible so that actionable steps can be taken. This is why is important to invest in Artificial Intelligence that can properly evaluate data as quickly and effectively as possible. 4) Security and transparency must be prioritized when collecting data from citizens. Data must be handled and used in the right ways. 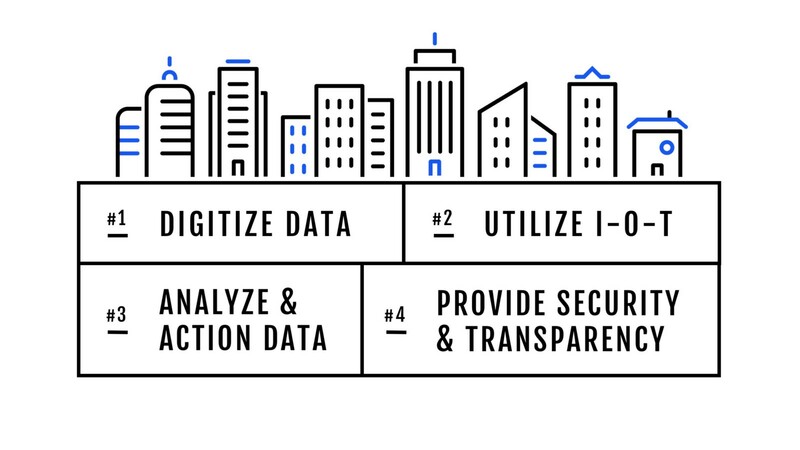 As IT and data collection become more central to the way we function every day, these principles should serve as the foundation that cities and states use to ensure that they are utilizing technology in the best ways. It’s clear that tech systems and how we interact with them have substantially changed from the time I was a student at McCombs. Reflecting on how far we’ve come, I’m looking forward to the future of govtech and our company’s role in helping shape “smart” communities. To access Erin’s full speech, click here.